Happy Easter everyone! What’s on your dinner plate? April 6, 2015 April 6, 2015 ~ Trevis Dampier Sr. The resurrection of Jesus from the dead is the foundation of the Christian system (cf. 1 Corinthians 15:14ff). If there was no resurrection, Christianity is a hoax, and we are wasting our time. But the truth is, the event of Jesus’ resurrection is incontrovertible. Professor Thomas Arnold of Rugby, a world-renowned historian, once said that Christ’s resurrection from the dead is the “best-attested fact in human history” (1939, 2569). This being the case, just what is the significance of Jesus’ resurrection? Think about these matters. First, the resurrection is one of the major evidences that Jesus Christ is the Son of God. Paul affirmed that Christ is “declared to be the Son of God with power . . . by the resurrection from the dead” (Romans 1:4). Second, Jesus’ resurrection represents an assurance that we can have forgiveness from our sins. Paul contended: “[I]f Christ hath not been raised, our faith is vain; ye are yet in your sins” (1 Corinthians 15:17). The reverse of the apostle’s affirmation would be this: if Jesus was raised, sins will be forgiven when we obey the gospel (Acts 2:38; 22:16). Third, the resurrection tells the world that the kingdom of God is ruled by a living sovereign. The founder of Islam is dead and his bones lie dormant in the earth. But the founder of Christianity—sixty years after his death—appeared to John on the island of Patmos and said: “I am the first and the last, and the Living one; and I was dead, and behold, I am alive for evermore” (Revelation 1:17-18). Fourth, Jesus’ resurrection proves that physical death is not the termination of human existence. God, who is the giver of life (1 Timothy 6:13), has the power to reanimate the human body. Christ’s triumph over the grave is Heaven’s pledge to us that we too shall be raised. This is why Jesus is referred to as the “firstfruits of them that are asleep” (1 Corinthians 15:20,23). Fifth, the Lord’s resurrection previewed the ultimate victory of Christianity over all its enemies. In the book of Revelation, Jesus is depicted as a lamb that had been slain, but was standing again (5:6). This same Lord was “the lion of the tribe of Judah” that had overcome his foes (5:5). Christians too will overcome as a result of the Lamb’s sacrifice and victory over death (cf. Revelation 12:11). Happy Easter or Happy Resurrection Day to my Christian brothers and sisters! For this glorious day of celebration for the Resurrection of Our Lord and Savior Jesus Christ; I ask you how are you doing your celebration? Did you have a big BBQ with the family and hearing the sounds of kids laughing searching for Easter eggs? Did you go to church this morning and plan to eat a nice dinner at a gourmet restaurant? Or are you at home snuggling and cooking a nice home cooked meal? Whatever you are doing, please make sure today that you do your best to let the stress fall away. Enjoy life! It is too short to let days pass away in misery rather than enjoying the little things in life. Today Virginia and I woke up and attended a great church service at Jubilee in San Jose,Ca. The weather was a little chilly today so a soup sounded great. 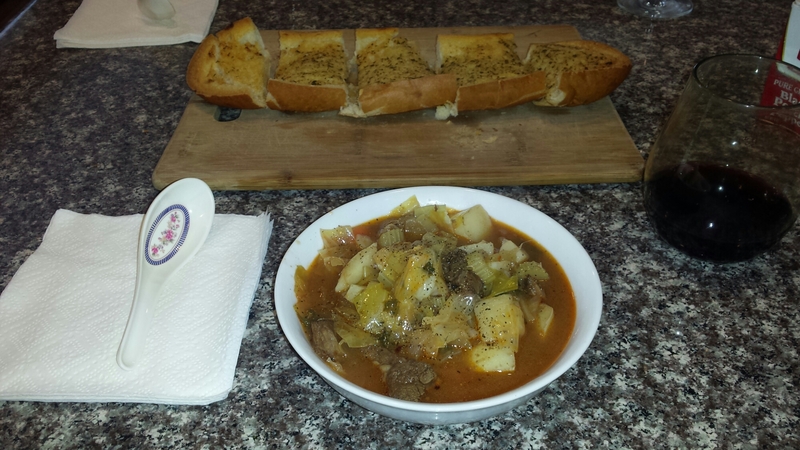 We had a left over trip tip steak in the fridge so what better way to use it than being sliced up in a delicious soup. The soup was light but flavorful and tasted like a gourmet masterpiece! The items contained in it were scrumptious and filling and a crisp bite of the garlic bread just made the meal complete. I’ve added the recipe on top of this page so make sure you try it out. I give it 2 thumbs up and promise you that you won’t be disappointed! I thank you all for joining me on this Holy Day and I look forward to seeing you on the next run! Keep hope alive! < Previous I’m one happy fella with a dish of Paella!! Next > Please. ..Please. .Please. .Give me a Bacon Burger with Bleu Cheese! !